Increasing levels of auto ownership and use are causing severe social, economic, and environmental problems in virtually all countries in Europe and North America. 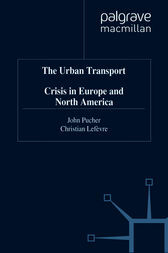 This book documents the worsening transport crisis and differences among countries in their urban transport and land-use systems. The focus is on public policies to deal with urban transport problems. Through in-depth case studies of eight countries, the book seeks to evaluate the effectiveness of alternative solutions to transport problems, and thus a way out of the transport crisis.